Take off and grate the cucumbers. Put in a muslin cloth and squeeze to extract extra moisture. 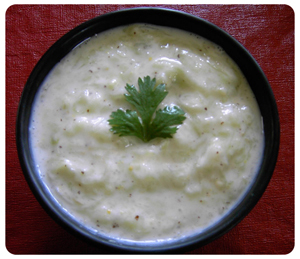 Mix everything yogurt, cut coriander leaves, cut green chillies, cumin powder and salt. Mix in the grated cucumbers just before serving.